I am a Yankees fan. I am a Yankees fan in the midst of a family of Red Sox fans. I am the only sane person in a family of crazy people. And I am no longer fond of Billy Beane. I went to see a sneak preview of Moneyball tonight at the Twin Creek Cinema. This is a beautiful theater. The room smelled clean (I know, a theater that didn't smell like rotten oil and decades old sugar encrusted floor? ), and looked incredibly clean. I sat between two of those Red Sox fans, (again, crazy people). The movie starts and we are looking at the fall of 2001. The Oakland A's are playing the New York Yankees. Winner moves on the the finals. Derek Jeter steps up to the plate. The pitch is thrown... Needless to say the crazy people on either side of me did not want to see what happens next. The A's go home to watch the World Series in comfort. 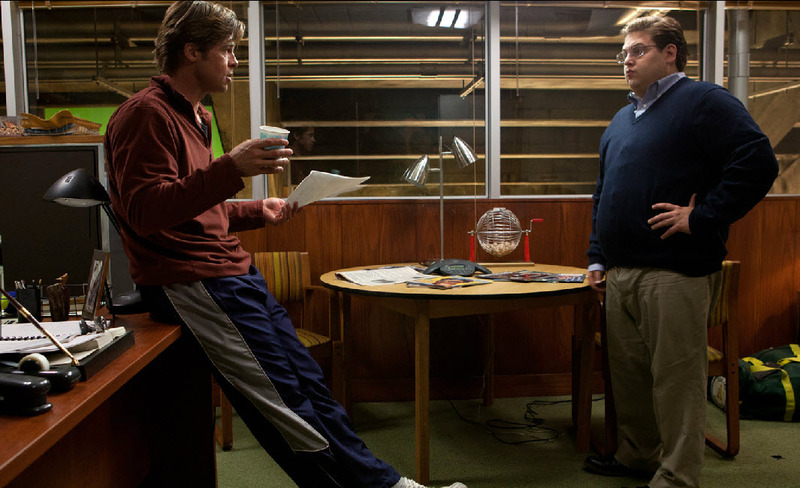 Moneyball is not about that season of baseball. 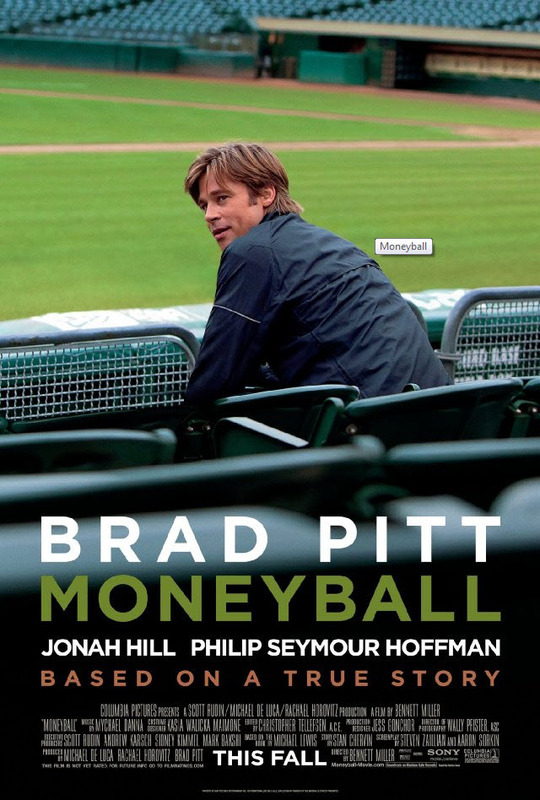 It's the true story about how Billy Beane (Brad Pitt) decides to but the system and run the team a whole new way. Pitt plays a determined General Manager who is also a ex-player, and a loving father. He is chasing that dream of playing the final game of the season. He stumbles upon this roly-poly kid named Peter Brand (Jonah Hill) who has an economics degree and a radical approach to evaluating players and to winning a season of baseball. This might just be the ticket Beane needs to turn things around. 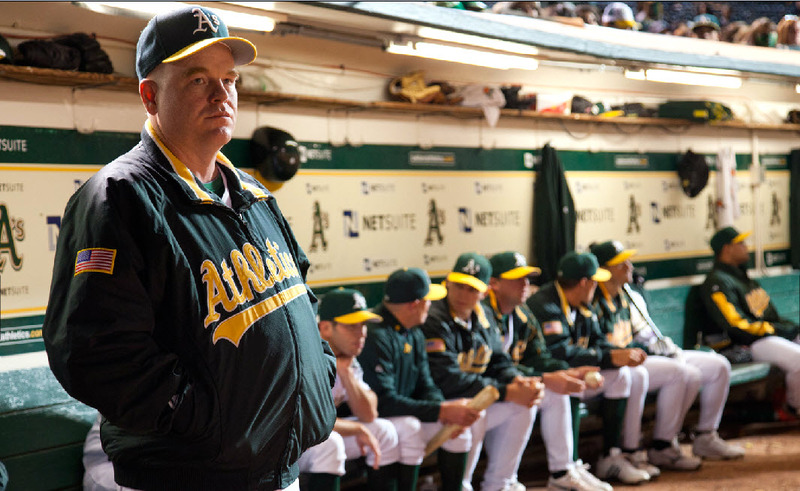 The coach , Art Howe (Philip Seymour Hoffman) is no fan of this plan. He does what he feels is right regardless of the wishes of the GM. Along with the stars I have already mentioned you will also be treated to the beautiful voice of Kerris Dorsey playing Beane's daughter, Casey. The surprise I didn't realize until looking it up later? His ex-wife is non-other than the princess bride herself, Robin Wright. Make sure to see this movie, it is so worth the money. Oh yeah, why do I not like Beane anymore?